New from StorDigital the LightScribe duplicator supports silkscreen-quality disc label printing direct from a DVD and CD duplication tower. Burning and printing large volumes of discs has never been easier, thanks to a new range of DVD and CD duplication towers from StorDigital. The new standalone LightScribe duplicators are available in configuration from 1 to 15 targets and allow users to burn and label their discs in a traditional-style standalone tower copier. This is the perfect solution for any company or individual who wants to make the best impression with their disc. 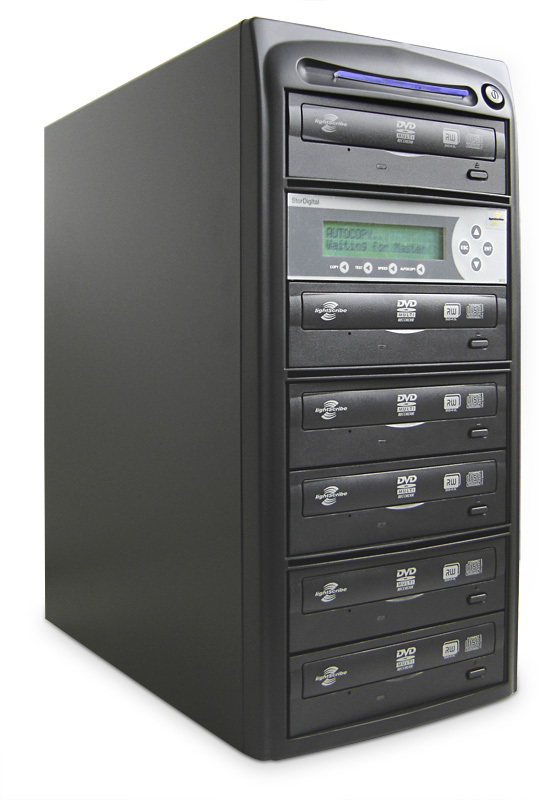 StorDigital LightScribe duplicators feature patented HP LightScribe disc labeling technology. By utilising a special disc, LightScribe duplicator operators are able to burn their discs, then flip them and then burn a label or image on to the top of the disc. By offering duplicators featuring this enhanced functionality StorDigital Systems are revolutionising the traditional in-house production process. He added, "We don’t consider that the LightScribe system is perfect for everybody. It won’t replace our automated inkjet printers, but having a tower duplicator that can also label your discs is a strong selling point". StorDigital LightScribe duplicators featuring HP LightScribe technology are available now from CD-writer.com Ltd and StorDigital Systems on 0208 293 0777. To register for a CD-writer.com trade account log on to http://reseller.cd-writer.com. RapidDuplication is a new digital media copying service offering 24 hour turnaround on high volume production of discs and USB drives. Ideal for situations when CDs, DVDs, Blu-Ray disc or USB drives need to be duplicated fast RapidDuplication.co.uk is your emergency duplication partner. Helene Zorzi from RapidDuplication Ltd had this to say " Our new service is the answer to an increasing need from our customers to get their product to market quickly. Digital media has become a very time sensitive commodity and the value of content can depreciate quickly. With RapidDuplication our customers are guaranteed to get their product on the streets fast, giving them a competitive advantage"
She added, "Typical customers of the fast turn-around service would be, live event recording specialists, conference organisers, church AV specialists, recording artists, marketing or press agencies, trade exhibitors or any business that is about to miss their deadline. We're offering a premium service to a growing customer base who need their product fast. " Duplication and disc production is becoming increasingly specialised as physcial media competes and compliments digital distribution channels. Delivering content to customers faster than your competitors is an obvious advantage. Combine this with a premium service like RapidDuplication, and you get an instant unique selling point for your product. RapidDuplication – number one for high speed duplication. RapidDuplication.co.uk is a trading style of CD-writer.com Ltd, a leading UK supplier of digital media technology and services. To find more information and contact details visit www.rapidduplication.co.uk or call 020 8293 0777 or view browse over 70'000 product lines at www.cd-writer.com.